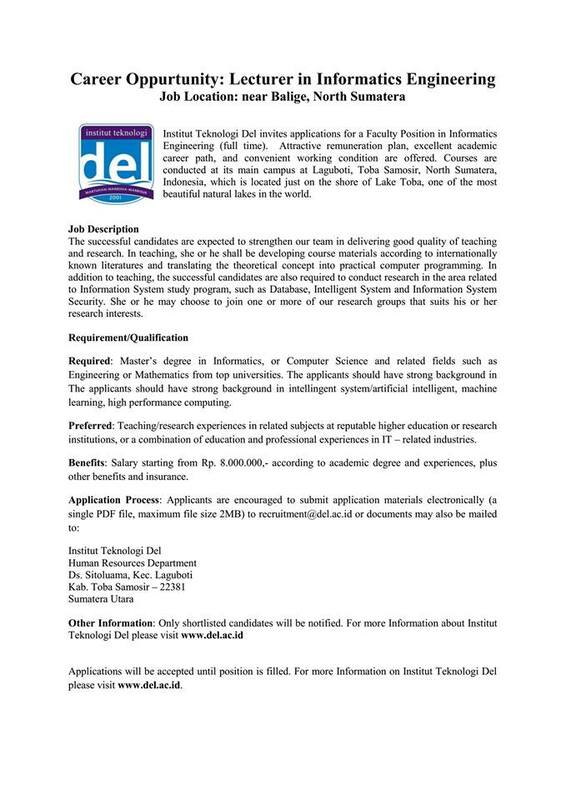 institut teknologi del invites applications for a faculty position in informatics engineering (full time). attractive renumeration plan, excellent academic career path, and convenient working condition are offered. courses are conducted at its main campus at laguboit, toba samosir, north sumatera, indonesia, which is located just on the shore of lake toba, one of the most beautiful natural lake in the world. the successful candidates are expected to strengthen our team in delivering good squality of teaching and research. in teaching , she or he shall be developing course materials according to internationally known literatures and translating the theoretical concept into practical computer programming. in addition to teaching, the successful canditates are also required to conduct research in the are related to information system study program, such as database, intelligent system and information system security. she or he may choose to join one or more of our research groups that suits his or her research interersts. required : master's degree in informatics, or computer science and related fields such as engineering or mathematics from top universities. the applicants should have strong background in the applicants should have strong background in intelligent system / srtificial intelligent, machine learing. high performance computing. preferred : teaching / research experiences in related subjects at reputable higer education or research institutions, or a combination of education and professional experiences in IT - related industries.